Toshiba is bringing a tablet computer aimed business users to the UK market in the form of the WT310. 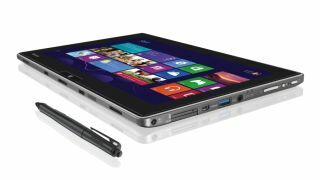 Running on Windows 8 Pro, it comes with an Intel Core processor, an 11.6-inch HD screen and a DigitizerPen, and weighs in at 825 grams. Security and data management features include Intel Anti-Theft software to reduce the risk of unauthorised access, the Trusted Platform Module to safeguard locally stored data, and Intel Management Technology for remote monitoring and maintenance. Connectivity comes from a USB 3.0 port, a HDMI micro SD card slot, b/g/n or a/g/b/n Wi-Fi, Bluetooth 4.0 and support to HSPA+/LTE networks. The tablet's content can be displayed on a larger HD screen through an HDMI micro port, and the Intel Wireless Display makes it possible to transfer multimedia to a compatible TV set or projector without using cables. An optional docking cradle makes it possible to connect the WT310 to a keyboard, mouse or external hard drive. It also has a Gigabit LAN port for access to a corporate network. It is due to become available in the UK in the current quarter.